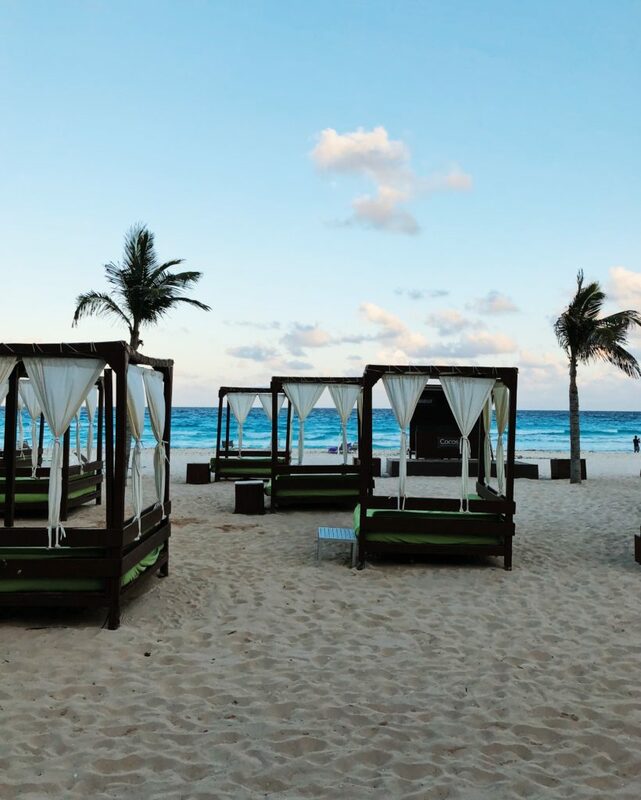 Last week, I had the privilege of going on the funnest girl’s trip with my mom and sister to Paradisus Cancun. I’ve been to Mexico many times and stayed at several different resorts there, but you guys…this one stands out among the rest! Before I go into my full Paradisus Cancun resort review, let me just say…on a scale of 1-10, I’d give at least a 9.5. Everything from the food to the service to the beach was absolutely fantastic! I can’t wait to dive into the details and share everything with y’all! Paradisus Cancun is a quick 20 minute drive from the Cancun airport, which was so nice! 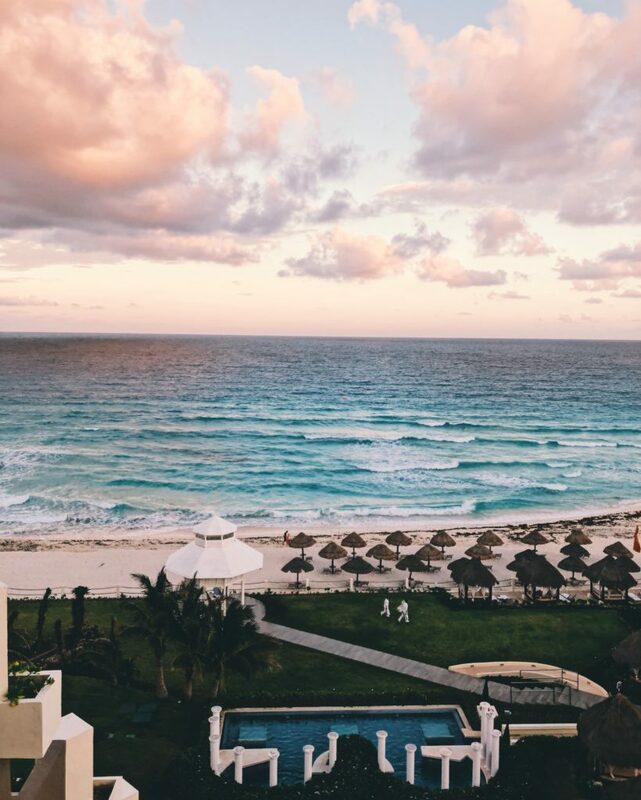 TBH, I typically feel like the beaches in Cancun aren’t anything spectacular…but the beach / ocean at Paradisus Cancun totally changed my mind! As you can see from the above photo, the color of the water was absolutely breathtaking! The prettiest turquoise blue water, and a great beach to walk on! We went for a walk two different days and walked about a mile each time! Our rooms at Paradisus Cancun were so cute and had the most amazing views! Jill and I shared one room with a king size bed, and my mom had the other room, with two fulls. Both of our rooms were plenty spacious, with really comfortable beds, and a stocked mini fridge that they re-stocked daily! The bathroom was also really spacious and had a very nice shower! Housekeeping always did a great job keeping our rooms clean and we loved the chocolate they brought every night for turn-down service! 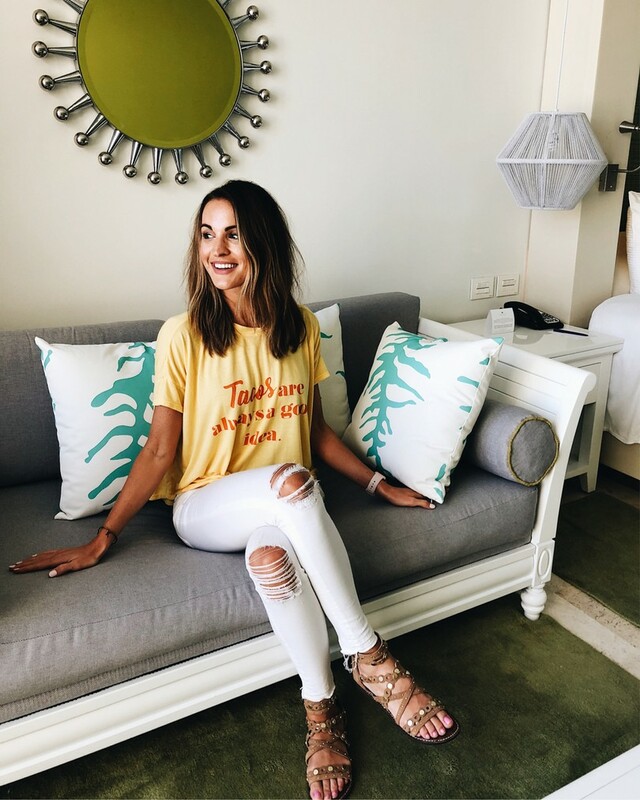 There’s an option at Paradisus Cancun for “Royal Service” during your stay, which we had, and I think it’s 100% worth it IMO! It’s the “adults only” option for Paradisus Cancun, if you’re wanting a little extra pampering, privacy, and premium liquor during your stay. Paradisus isn’t an adults only resort, but since we had Royal Service…we rarely saw kids the entire time, so it definitely felt like an adults only resort! Royal Service guests have their own pool they can go to, an entire separate building where our room is, exclusive bars, etc. It was amazing. Our service at Paradisus was a 10 on a 10 y’all. Our butler made dinner reservations for us every night, we were literally waited on hand and foot by the pool (like we never had to wait for a drink), and everyone who worked at the resort was always SO nice. Even the waiters in the restaurants there were so friendly and attentive. The service at Paradisus Cancun is definitely something that makes it stand out from other resorts I’ve visited! It was seriously so nice. The grounds at Paradisus Cancun were so nice! The resort is pretty huge so we got lost a few times haha. But, as you can see…there are several pools at Paradisus and all of them were stunning. They have “bali beds” both at the pool and on the beach, which we definitely took advantage of. (Jill got burned the first day so homegirl needed some shade LOL). Paradisus also has a really nice fitness center that the three of us went to every morning (woop woop!). Speaking of fitness center – Paradisus also has fitness classes like crossfit, bootcamp, and spin classes you can take during your stay! You know…if you’re into that type of thing. Okay, in addition to the amazing service…the food at Paradisus Cancun was close to the best I’ve ever had at an all inclusive resort. I know, I know. 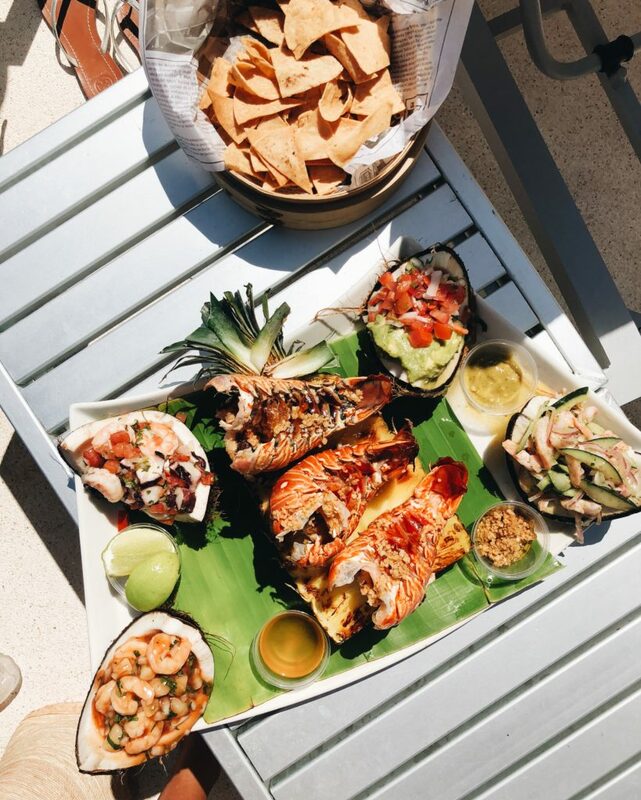 Most people think all-inclusive resorts don’t have great food, and that might be true for most of them. But we LOVED the food at Paradisus Cancun!! I don’t even know where to start. 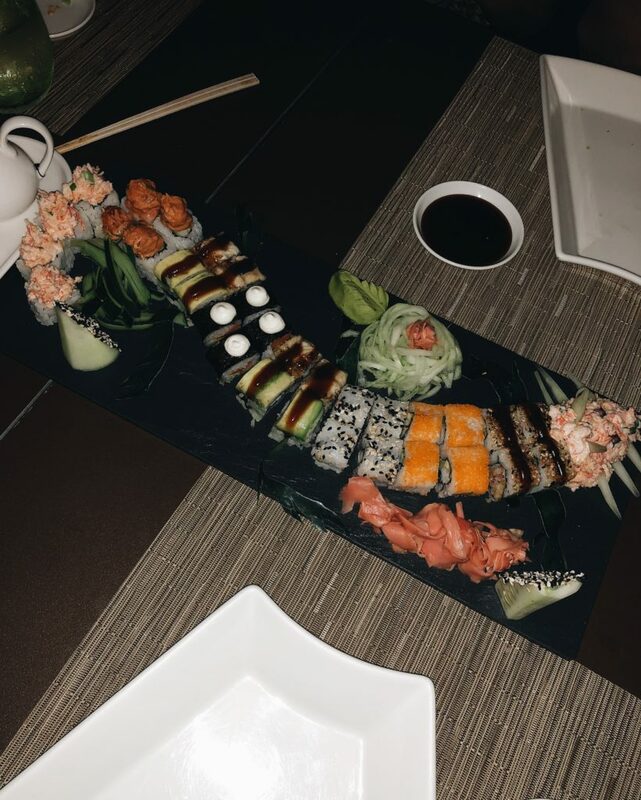 The last picture in the cluster of photos above was taken at their Asian restaurant and it was some of the best sushi I have ever had! They basically brought us a sample plate of everything they had and everything was so good. 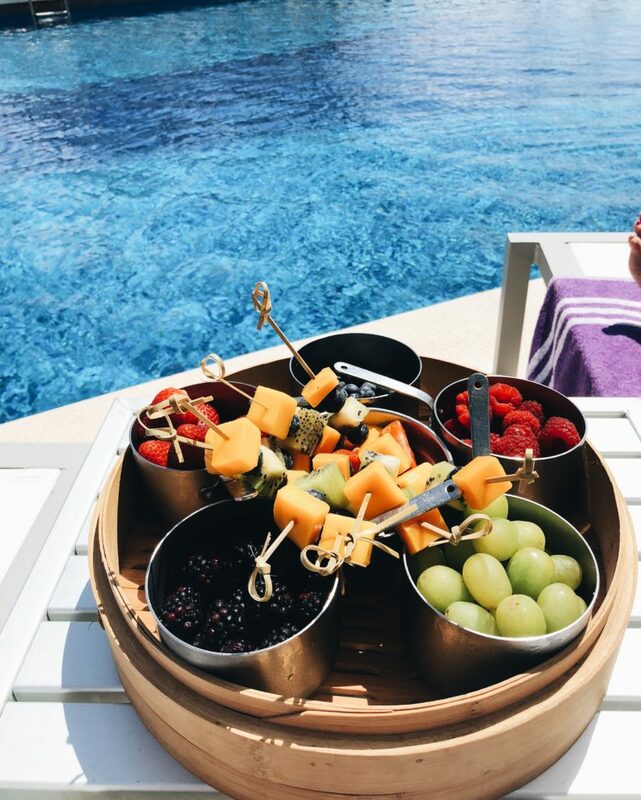 One day, they actually brought us fresh fruit and LOBSTER out to the pool for lunch! We were in heaven! Everything tasted so fresh and so full of flavor! 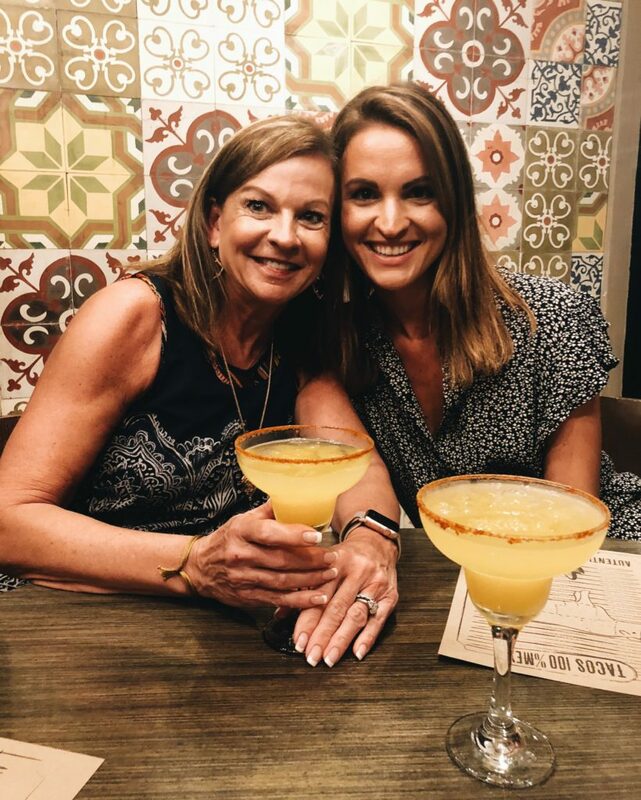 We also loved the Mexican restaurant (Blue Agave – where my mom and I are pictured with our margaritas). They have tons of different types of tacos and all were amazing. We ate breakfast at the main buffet everyday and it never disappointed. AND – there’s a gelato bar where you can get unlimited gelato all day long. So, y’all know I was in heaven! I won’t bore y’all with every single detail about every meal we ate there…but believe me when I say, you will not be disappointed in the food at Paradisus Cancun. It definitely exceeded our expectations! By the way, all the outfit details for all the outfits you’re seeing in this post can be found in this blog post, or on the “shop my instagram” page of my blog! I honestly could go on for pages about how much we loved our stay at Paradisus Cancun. After spending 4 nights there it definitely made me want to visit their other locations! I also loved getting DM’s from you guys while we were there saying that you honeymooned there or have a trip coming up! 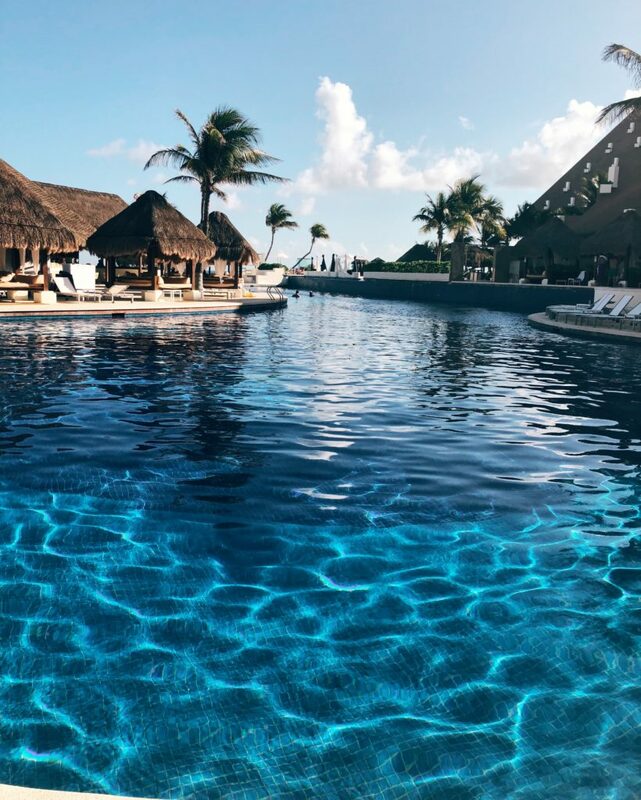 Comment below if you’ve stayed at any of the Paradisus resorts, and which one has been your favorite! We were at paradisus the same time that you were ! We loved every second. We did the family concierge which is the equivalent of royal service but for families! We found the food and service amazing there as well and we can’t wait to go back! aw that’s so fun! and I love that they have a family-equivalent option – that’s so perfect! We are headed there with the Family Concierge service in 2 weeks! Hope it lives up to this!!! Slight nervous about traveling to Mexico right now, but this is making me excited! We went to an all-inclusive in Cancun for our honeymoon and the only thing we weren’t impressed with was the food. 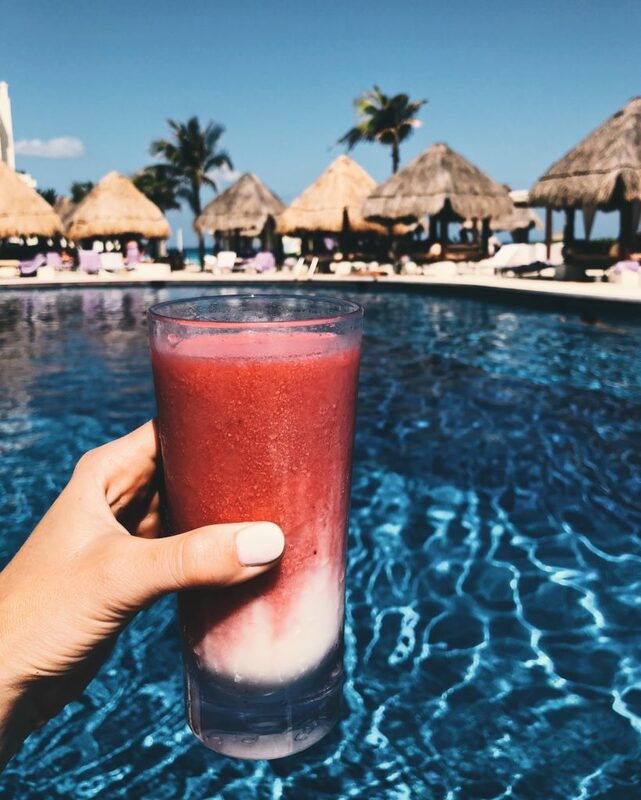 We’ve talked about going back to a different resort and I’m adding this to our list! Sounds amazing! I definitely think this is some of the best food i’ve had at an all-inclusive for sure! hi! there’s a video on my instagram highlights and also a blog post where I share my makeup routine. thank you so much! My boyfrirend and I stayed at the Paradisus in Punta Cana and it was AMAZING. I can’t wait to try all the Paradisus resorts because they are so great and fairly priced. oh that one also looks amazing! they really are such incredible resorts! I love this!! My boyfriend and I stayed at Paradisus in Punta Cana last August and it was absolutely amazing! We stayed for 10 days and had the Royal Service and oh my goodness, after 10 days of that we were completely spoiled! haha I’m so glad you had a great time and to hear that their excellent service is throughout their whole company and not just by location! We stayed here over thanksgiving and did the royal service. the resort is so beautiful and the food was amazing!! aw I bet that was the perfect thanksgiving! so happy y’all enjoyed it as much as we did! I visited this same resort for my birthday four years ago, but I sadly got the stomach flu right before leaving so I couldn’t enjoy any of the good food! 🙁 It was such a beautiful resort though, and it was awesome reliving it through your photos! oh no! that is so sad. sorry that happened. hope you’re able to make the trip again sometime! it really is a gorgeous resort! Wonderful blog post! Stayed at Paradisus Punta Cana and the Paradisus resort in Playa del Carmen. 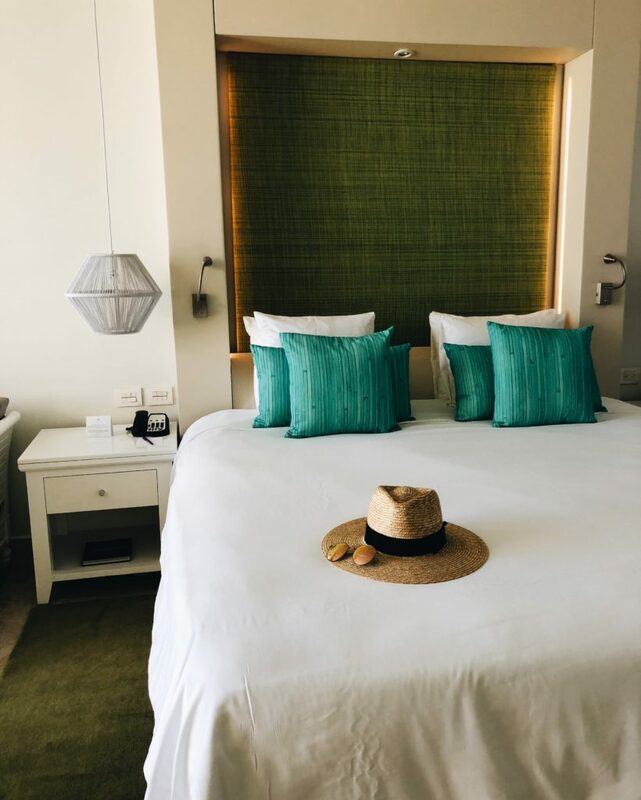 We went with the Royal Service option in Playa del Carmen, and had a wonderful time! We had a personal butler, 24 hour room service and access to restaurants for Royal Service guests only. Very nice all-inclusive! Already looking forward to our next Paradisus resort stay! yes! the royal services option is the ultimate luxury!